With the evolution in all the other industries, so did the food industry bloomed out. Gone are the days when you got your restaurant menu printed on a fine expensive paper! Rather restaurant makers have made a smart switch to digital menu systems with a huge series of customized features in it. Managing restaurants has become more easy, flexible, interesting, and accurate as compared to the earlier times. Things have become error-free while switching to a fully automated platform! Choosing a POS system for your small business! When your business is at a startup stage, it becomes inevitable to skip quality and customer experience. Agree? So, utilizing the best benefits out of technology trends becomes a major need for the startup businesses. Offering your customers the best services, a comfortable environment, easy ordering, easy payment methods is what all a customer expects from your restaurant. And if you fail to do that, then get ready for a downfall of your restaurant name. Implementing a POS system is an answer to all your questions and will assure you 100% happy and satisfied customers. Want to know how a POS system can help you in raising your startup food business? Get through the below list of benefits a POS system can offer you. 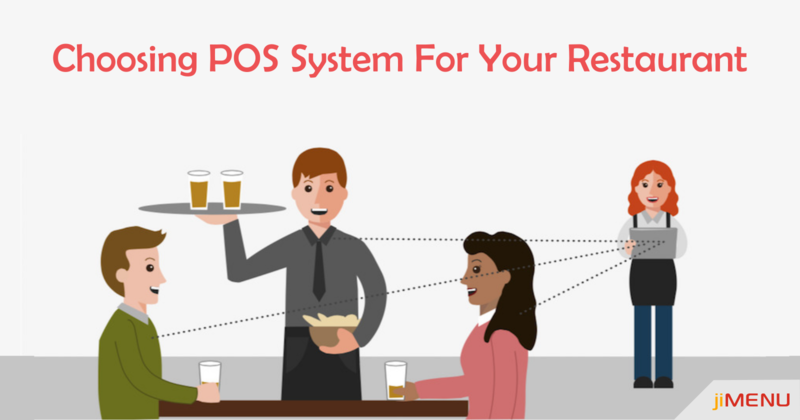 You would definitely love to make an instant switch to a POS system for your restaurant! Making easy payments would be the biggest sigh of relief for the customers if they get online payment methods via their cards. Isn't it? So, make sure that the POS accepts all type of payments including cash, cards, and cheque or not? Definitely, a good vendor, like jiMenuPOS would include all the payment methods so that the customer can choose the suitable one and pay their bills accordingly. Apart from payment methods and making the customers happy, you even need to figure out that the POS system you are choosing is beneficial for your staff and management members too or not? So, look up for some following points and choose the one which includes all of them. Sales analysis report: Getting monthly or weekly sales report your restaurant has made would be such a relief. Right? Because managing sales report manually would be such a pain and tiresome task. POS system would help you in figuring out about the food categories in which you get more orders and need to increase the stock. Moreover, in which food category are you getting fewer orders and need to improve food quality would be easy to analyze. Real-time order tracking: Making the orders and till the time they reach the kitchen areas, there happens a lot of mistakes. Isn't it? And if yours is at a startup stage, you can't dare to afford a mistake with your customers, or you'll lose them forever. POS system will allow you to make orders over an automated platform which eliminated the chances of mistakes and lets you take all the orders accurately. Table management: Directing the customers towards a vacant table isn't affordable for the staff as it engages a lot of your staff. POS system allows your customers to look up for the vacant tables and choose the desired ones for them. This will reduce the hassle while choosing tables and even make the customers happy as they can choose the tables as per their wish. Benefits of choosing jiMenu POS for your restaurant! jiMenu POS is one such perfect platform which comes as an all-in-one package for your restaurant. It serves your customers with all the above features and in a budget-friendly manner. For customer support and assistance, we offer you 24/7 services from our expert team. To get a free demo or for more queries, get in touch with us and experience the best!